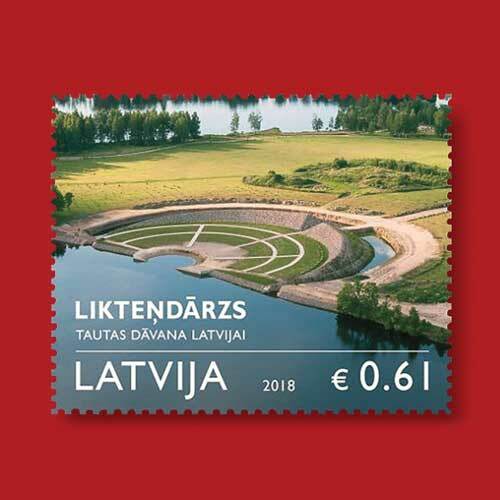 Latvia Post celebrated the country’s 100th anniversary by releasing a special 61¢ stamp featuring the Garden of Destiny on 18th May. Situated on an island in the Daugava River, the garden is a beautiful amalgamation of nature and architecture. One of the architects of the Garden has stated that the view terrace and pavilion highlight the beauty of River Daugava. Jaunzems, Laura Laudere, Jaunromans, Abele, and Shunmyo Masuno have together designed the garden. The stamp features a photograph of the amphitheater which is situated at the center of the garden. The amphitheater is surrounded by a huge stone formation called Silver Sunset. It is made out of 50,000 stones brought by Latvians in memory of their departed loved ones. A canal also surrounds the amphitheater which denotes the nation’s tears with a hope that the horrific events from their past would not occur again. The picture was taken by Gatis Balodis while Arvils Feldmanis designed the stamp. Baltias Banknote of Latvia printed the stamp in sheets of 20.